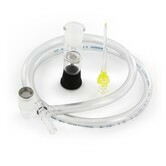 The Extreme Q Vaporizer by Arizer is the latest and one of the greatest vaporizers on the market. It is the latest high-tech model by Arizer and will not disappoint. It boasts a multitude of functions not found in most vaporizers, making it a serious player and an ideal choice for those who love to vaporize but want nothing but the best. The Extreme Q Vaporizer is the latest in vaporizing technology from Arizer. It has unique features rarely found anywhere else on the market. 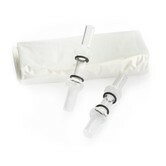 It offers users the option to enjoy their vapor with either a balloon bag or whip attachment. The Extreme Q Vaporizer employs a Cyclone Bowl that stand vertically to ensure an even and pleasurable distribution of vapor, allowing for full flavor and potency to be unlocked. It has automated fan speeds controlled by an inbuilt temperature activation system and the LCD display shows both the actual and preset-target temperature. The glass used in this Canadian beauty is of the highest quality, adhering to strict production guidelines ensuring that your vapor is toxin taste free. It utilizes high-quality ceramic heating to ensure that toxins are burnt away and you are left with the finest and safest vapor possible. The heating elements boast the ability to reach vaporizing temperatures within 2 minutes due to high-tech inbuilt heat sensors. It also has an auto shut feature that can be set just in case the quality of the high you reach causes you to drift off into sleep. The Extreme Q Vaporizer also has a handy remote control, so you can kick back and relax without having to worry about getting up – ideal for those couch locking highs. All of this functionality also means it can serve as the perfect oil diffuser or aromatherapy vaporizer for those more spiritual amongst you. It is a great quality product for those looking for a top end vaporizer. You will not be disappointed by the great features and professional build of this machine. The Extreme Q Vaporizer by Arizer comes with a lifetime warranty that covers defects related to the heating element - you know you are investing in a great quality piece of kit when the manufacturer is that confident in their product.